Haunted by frightening dreams about her forgotten past, Isabella along with her fiance travels to an old ghost town, the only clue to her origins that she has been able to dredge from the depths of her lost memories. At the start of their dangerous journey, a terrifying creature attacks the pair. Isabella manages to escape by fleeing into the dungeons buried deep beneath the town, where deadly vampires lurk. Now, it's up to you to help Isabella as she tries to find her way out, reach the mysterious city of lost souls and rescue her fiance! 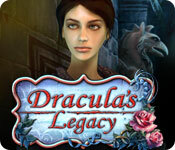 Find clever clues, solve perplexing puzzles and explore colourful locations in Dracula's Legacy.